What Paul Ryan and his minions just voted for is immoral. North Carolina Congressman Ted Budd cast an indefensible vote to repeal the Affordable Care Act and replace it with legislation that is so awful that Budd’s fellow Republicans were caught scheming to exempt themselves and their staffs from the measure’s draconian provisions. Good. The vote by 217 House Republicans to gut the Affordable Care Act (while 20 of their colleagues and 193 Democrats opposed the move) must be remembered as the shameful abandonment of health and humanity that it is. This should become the permanent stain on every member of the House who supported it—the issue that does not to go away. 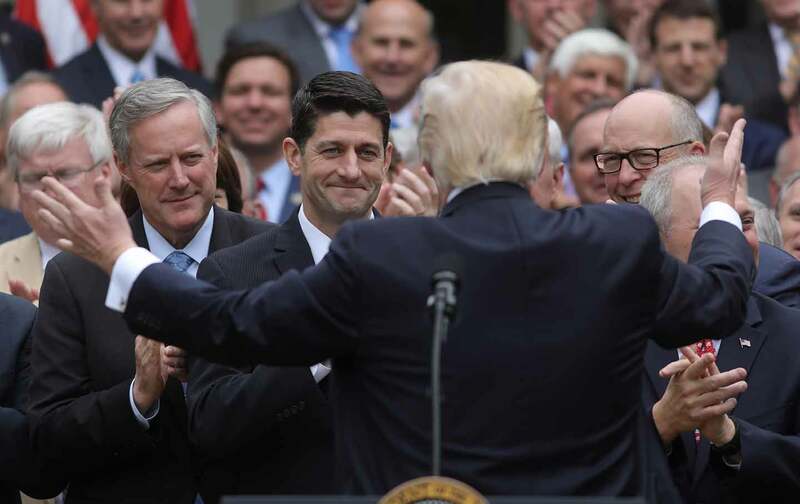 House Speaker Paul Ryan and his caucus abandoned any pretense of deliberative or responsible legislating in order to deliver an empty “win” for the flailing administration of President Donald Trump. House Republicans simply did not care. The overwhelming majority of them cast their votes as Ryan said they should, and then they ran the gantlet—past crowds of citizens chanting “Shame! Shame! Shame!”—on their way to a White House Rose Garden “celebration” of their partisanship with Donald Trump. That is precisely right. The health-care debate will go on. What House Republicans voted for on Thursday will not be the final word on this issue. But the votes those Republicans cast for this particular bill ought never be forgotten. House Minority Leader Nancy Pelosi warned Republican backers that “they have this vote tattooed on them. This is a scar that they will carry….” Her admonition should serve as a call to arms. Republicans now must be identified for what they are: charlatans who would lie to Americans with cancer and heart conditions about the health care they cannot live without. Representative Gwen Moore, Democrat of Wisconsin, got it right as she outlined her opposition to Ryan’s plan for the mangling of health care in America by tweeting photos of people who have battled leukemia and other diseases—constituents who had contacted her to express their fears about what the speaker of the House proposed to do to them. “They’re not numbers and statistics. They’re cancer survivors and people with disabilities. They’re sons and daughters,” explained Moore, who declared that she was voting “no” for them. The politics of health care is personal. It’s about whether human beings can get the care they require, about whether they will live or die. The choice that House Republicans made Thursday was inhumane. It should be remembered as such—and it should be continually condemned as such. Primary and general-election challengers to Paul Ryan and to every member of Congress who voted for Ryan’s “repeal and replace” scam—which Moore correctly described as “a massive tax giveaway masquerading as a health care bill”—should not be allowed to talk around what they have done. They should not be allowed to run in 2018 on whatever final reform eventually is agreed upon—if, indeed, an agreement can be reached. They should be held to account for their willingness to tear apart a health-care system in order to reward campaign donors and political allies at the expense of ailing Americans. These wicked politicians will face opposition in 2018. Their opponents should pull no punches. What Ryan and his minions have voted for is not just wrong. It is immoral. That is the message that must go forward from this awful day. No quarter should be given in delivering it.